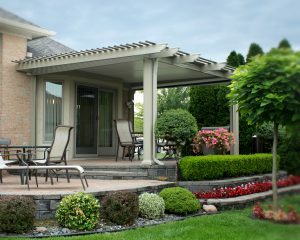 SRA Home Products proudly offers patio covers that can be fully customized to match your home in Egg Harbor Township, New Jersey. All of our patio covers are available in two colors — white and sandstone — so you can choose the option that will best coordinate with the color scheme of your home. St. Thomas — Our St. Thomas patio cover includes the thermal roof found on our standard model, but offers the added benefit of a curtain wall designed to house an optional retractable screen, which you can decide to have installed either now or at some point in the future. This model is supported by our elegant Florentine-style columns. Santa Fe — Our Santa Fe patio covers are similar to our St. Thomas models, in that they offer you the option of installing retractable screens. The Santa Fe model, however, features lattice trim that runs along the perimeter of the roof, allowing it to achieve the look of an elegant pergola. Sunlight Pavilion — Our sunlight pavilions feature an innovative polycarbonate roof that shields you from rain and harmful UV rays while still letting in natural light. The roof is available in three standard colors and millions of customizable colors. If you would like more information about the features included with each of the above patio covers, please call SRA Home Products today. Our team members look forward to helping you choose the option that’s best suited for your home in Egg Harbor Township, NJ.